Who knew that Senor Choppes could play the support role?! It really felt like we all picked roles and Jake was stuck with last pick so he played support. I was a bit skeptical going into this game, but it all worked out in the end. During the loading screen I saw that the enemy team was running some kind of kill lane. I was watching a movie so I had my microphone muted. I forgot to mention to Jake that we would probably need to ward really effectively and play back a bit. We’re walking to lane and I realized too late and clicked to unmute and said “Jake, look out.” Boom. Jake was throwing a ward into the front edge of the bush anyway and there was a Taric and Xin standing there waiting for us! They still tried to go ham on Lulu, who just laughed and skipped away. We dominated that lane. 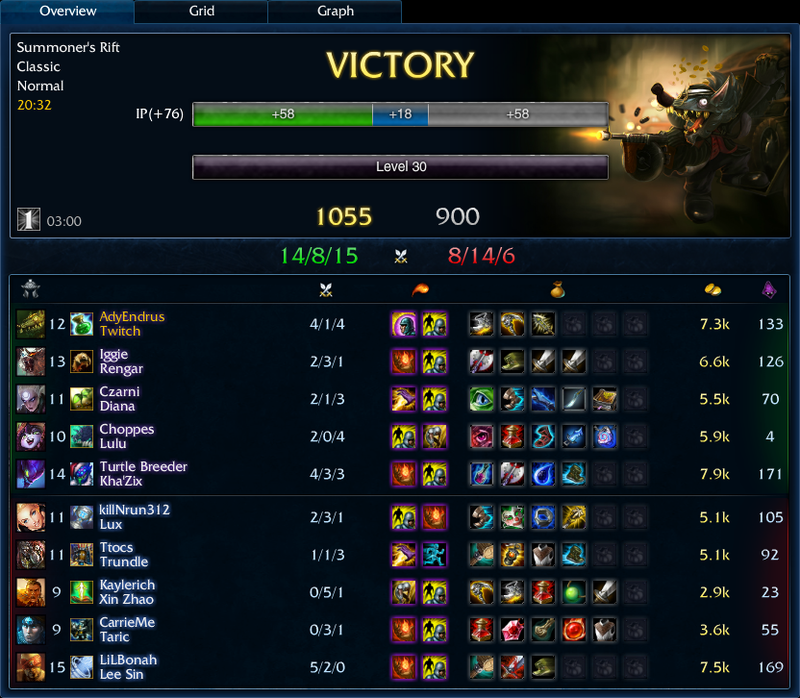 I had nearly 80 CS when the enemy bot lane had 15 combined. They were starved of experience and money, and just let us walk all over them. My only death actually came when I was killing both people in bottom lane and Lee Sin snuck down and caught me. His abilities show me through stealth, and I was so low on mana and health that there was no way to escape. It was sad. I definitely secured some kills at the end of the game to tie for most kills in this game. I just wouldn’t be able to sleep at night if our random Kha’Zix had most kills.